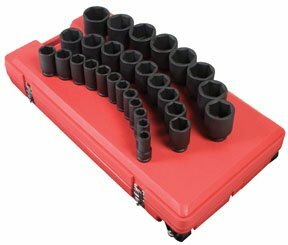 This Sunex 3/4-inch drive SAE deep master 29 piece socket set will give you years of usage. It comes with a lifetime warranty which backs the craftsmanship of this CR-MO alloy steel product. It features a a blow-mold case with wheels. Set includes: 3/4" (424D), 13/16" (426D), 7/8" (428D), 30mm (430M), 1" (432D), 1-1/16" (434D), 1-1/8" (436D), 1-3/16" (438D), 1-1/4" (440D), 1-5/16' (442D), 1-3/8" (444D), 1-7/16" (446D), 1-1/2" (448D), 1-9/16" (450D), 1-5/8" (452D), 1-11/16" (454D), 1-3/4" (456D), 1-13/16" (458D), 1-7/8" (460D), 1-15/16" (462D), 2" (464D), 2-1/16" (466D), 2-1/8" (468D), 2-3/16" (470D), 2-1/4" (472D), 2-5/16" (474D), 2-3/8" (476D), 2-7/16" (478D), 2-1/2" (480D).